Open plan offices, agile co-working and minimalist personal storage are all trends of the modern office. These influences are placing new demands on the humble desk organiser. Uninspired and disappointed with how desk organisers were responding to these needs, Premium Compartments got inspired and developed the new Inspire Desk Organiser. The challenge and resultant brief was to develop a desk organiser that: manages all forms of stationery and desk accessory hardware; allowed user customisation and adaptability for their changing working and storage requirements; fits into modern office and home work station environments stylistically; is long lasting and durable and easy to clean. Unlike the other desk organisers, when the acrylic dividers are not in use they are perfectly transparent, not adding visual clutter to the desk. The Inspire innovatively converts to an ergonomic laptop stand. Inserting two small panels into the underside creates an angled stand. Here the grid slots provide efficient and beneficial air flow cooling to your laptop. Some serious organisation and a splash of design flair to a home office only enhances a persons working day. Co-working / Hot-desk users appreciate the Inspire’s easily flat pack / set up to warm their space with a loved and personalised touch to an otherwise cold and impersonal space. At the end of the co-working day the Inspire can be flat packed with all of the kit panels neatly stored in the back of the base board and kept in location by the simple cardboard protective outer sleeve. 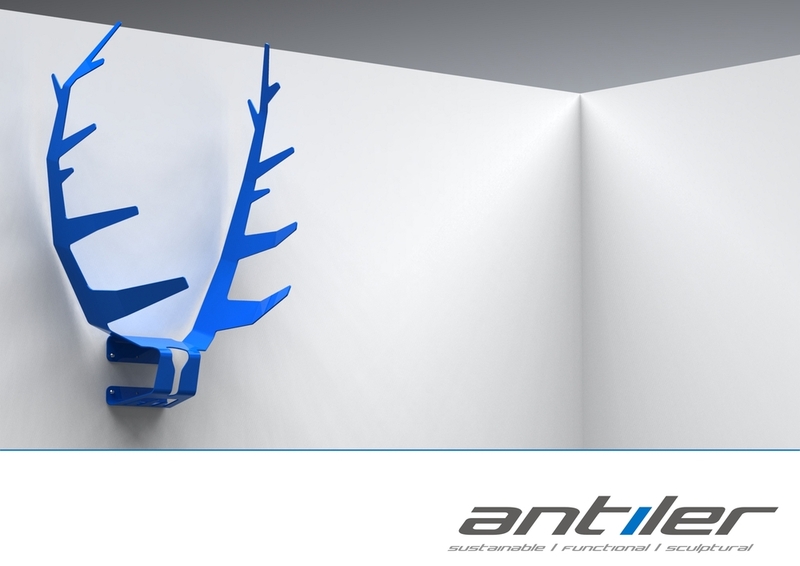 We love the beauty that a Deer’s antlers present to a room when mounted on a wall. We however hate the fact that such a majestic beast has been killed in order to achieve this wall sculpture and statement. 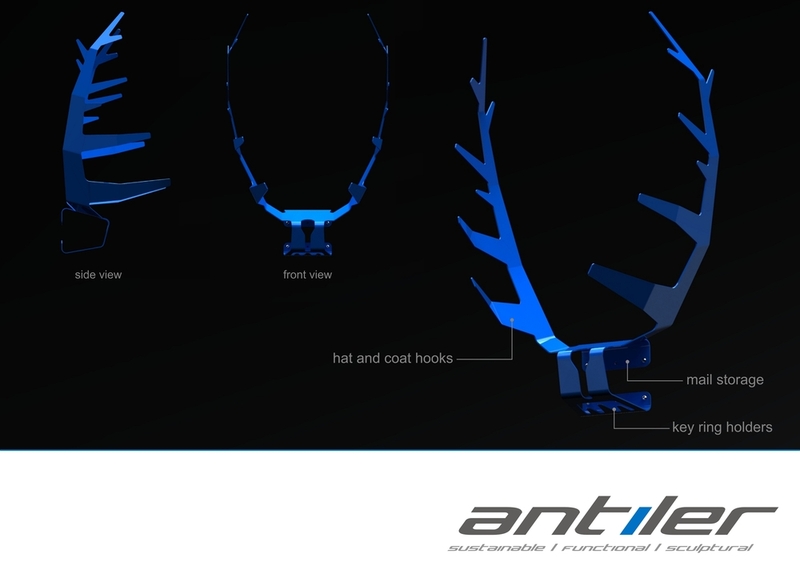 In response, we have developed a more sustainable alternative called the “Antiler” (anti-antler) range made from folded sheet metal. 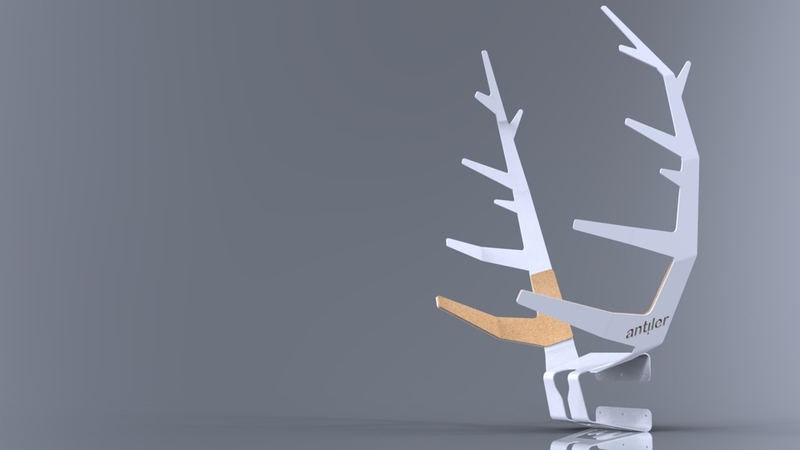 Whilst the sculptural elements of real antlers have been translated, the sheet metal material has allowed enhanced functionality not associated with real Deer antlers. We took a strong stance and a portion of every sale of our cruelty-free Antilers supports the immeasurably beneficial work performed by the World Wildlife Fund. For example, the largest Antilers in the range are made from 3mm thick mild steel. They are strong enough to hold bicycles, heavy coats and hats. The middle size 2mm thick mild Steel product can easily accommodate light jackets, hats and keys. The smallest Antiler in the range serves as a jewellery holder. The Antilers presented have been powder coated white however they will be made available in a wide range of bright and vibrant colours. Being powder coated in finish the mild steel is protected from corrosion allowing them to be installed inside or outside as desired. We find inspiration in nature everyday as a designer. 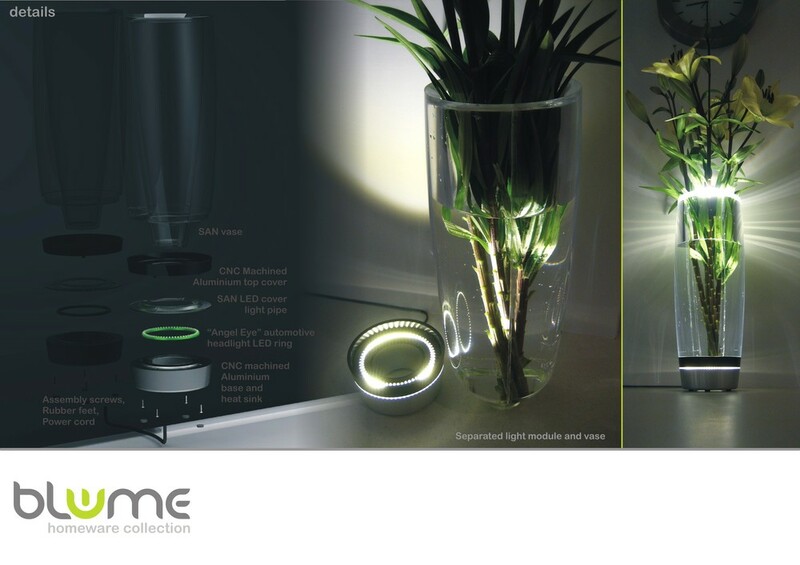 We developed the Blume range to celebrate nature within the home. Vases and bowls attempt to showcase the natural beauty of flowers and fruit however they are typically non-interactive objects that cease to exist or provide function at night when we are most at home. 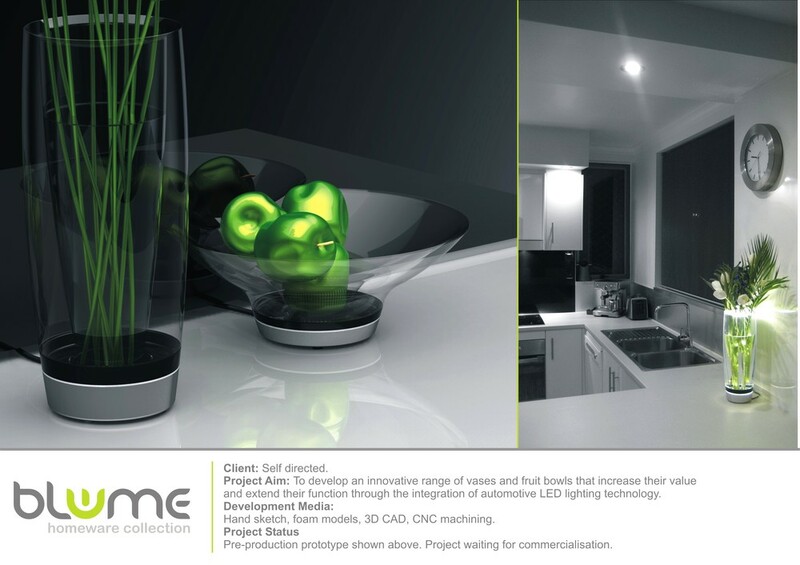 We realised that if I could successfully integrate lighting into these types of home ware pieces, products could develop with extended function as a night-light as well a decorative focal piece within the interior environment. 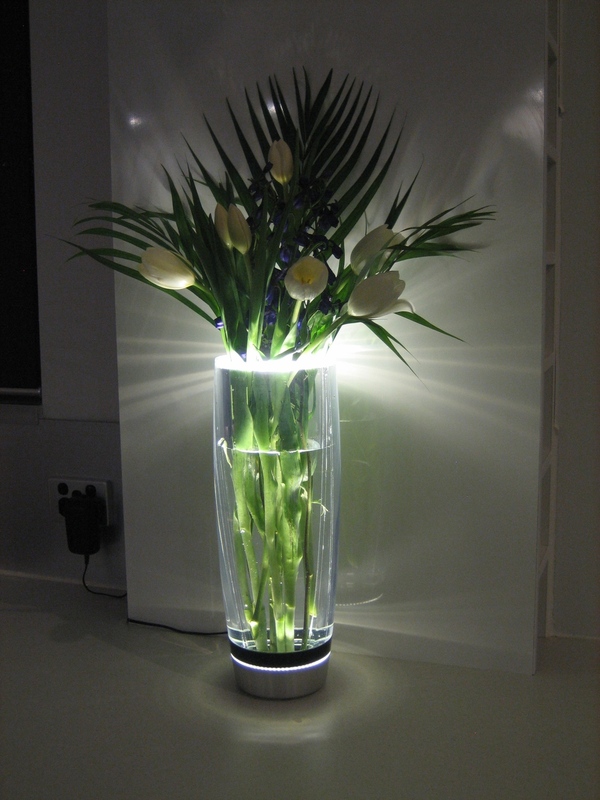 Come home to a dark house after a busy day at work and touch the metal base of the Blume piece to turn the light on and be greeted by a beautifully lit bouquet of flowers or arrangement of fruit. 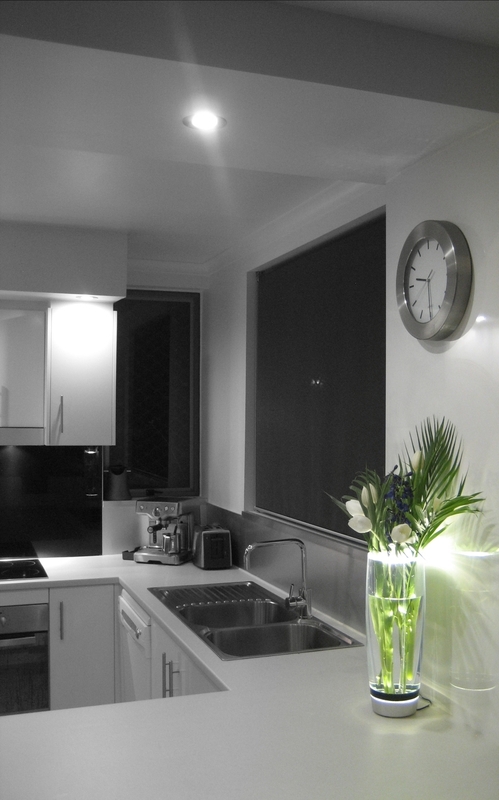 The Blume range uses energy efficient LED technology allowing you to leave the light on all night as a night light for the kitchen or lounge room. The vase or bowl can easily separate from the light base unit allowing for cleaning and storage. Premium materials and latest technology LED’s have been selected for durability and longevity. The design of the Blume range is sophisticated and will not date stylistically ensuring that the products last. At the end of their life the Blume range can be broken down into single material parts and easily recycled minimising their impact on the environment. 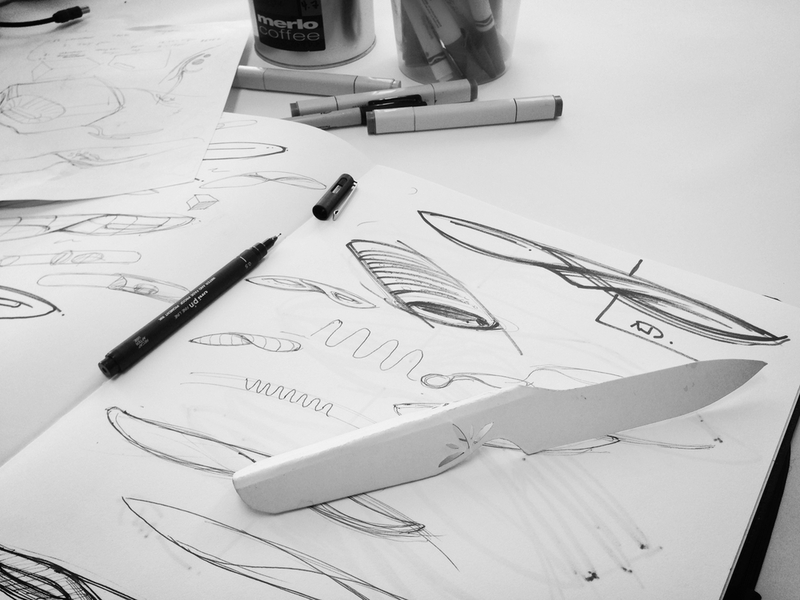 Functionally, the Signature Range can be used like any other spoon, fork or chef’s-knife. From a design perspective the range focuses on the sheet metal material and its simple press-break and press-forming manufacturing processes. This has resulted in a common folded handle design that is sophisticated and comfortable. The sheet metal has allowed the cutlery to be full sized, strong and comfortable without being heavy and difficult to hold. The cross-sectional “V” shape of the components allows the entire range to stack on top of each other reducing environmental shipping cost and saving space in the drawer. The main aim in the development of the Signature range was to explore a more sustainable solution for premium cutlery and chef’s-knives. Sheet metal material is efficient to manufacture and its forming process are less energy intensive. I knew that a more suitable product could be achieved by using sheet metal. The challenge was to take sheet metal that is often considered a basic material medium with low value and develop a premium looking product.